And then I noticed the block of cheddar cheese hanging out in the corner and the loaf of white bread. I knew my mission: A Scrapple Grilled Chese Sandwich. 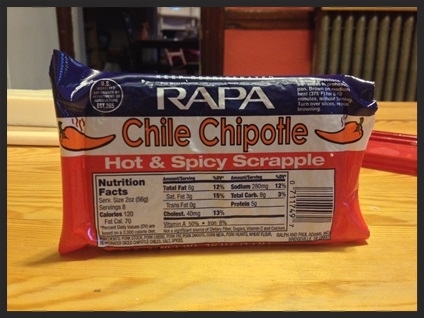 Among the dozen bricks of scrapple I had in the fridge, I was lucky enough that a few of them were the RAPA Chile Chipotle variety. The tagline: Hot & Spicy Scrapple. YES PLEASE! What makes this hot & spicy? Looking closer at the ingredients list, it includes "re-hydrated diced chipotle chiles." Don't worry, we're not talking super hot. But there is a small extra kick to every bite, which I kind of enjoyed. 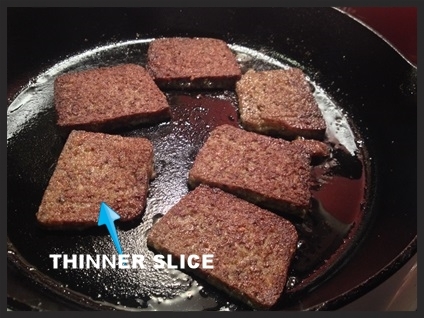 I cut up a few slices of scrapple. Some of them were the normal thickness you'd have as a side with eggs. 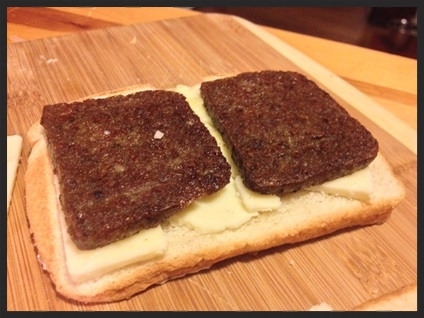 But I was careful to slice a few a bit thinner so that when they were inside my grilled chese the scrapple didn't completely take over the sandwich. And I prepared it like you would any other scrapple; nice and crispy on the outside. Once the scrapple was done, I sliced up a few pieces of cheddar cheese and arranged things. Again, I had a strategy. I wanted the sandwich to stick together and knew the cheese was my glue. So I put the scrapple IN BETWEEN the cheese. And finally, I stuck the bread together and cooked the sandwich up. Much like scrapple, the perfect grilled cheese sandwich is crisp on the outside and soft and gooey in the middle. I think I got that just about right. Please note: the diagonal cut is the only way to cut a sandwich. I can't believe you had to ask that. But since you did: yes, it was amazing. 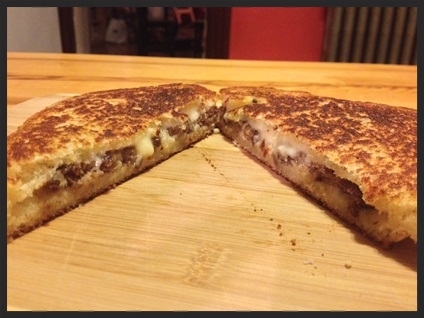 Any suggestions for making the Scrapple Grilled Cheese Sandwich even better? Let me know in the comments!